Sometimes what you see isn’t what you always get and that is so true for this drama. Neither one set out to fall in love, but it was inevitable since they mirrored each other in actions and outlook. When they first met, both had only one agenda and that was to look out for themselves. She only cared about protecting herself and surviving till the mystery of her death was solved while Eun Oh kept to himself and didn’t care about other people’s problems. So how perfect is it that two people so indifferent to the world end up the most empathetic. To the extent that he could sense her vulnerability under a facade of nonchalance with just a glance and she saw through his bravado to the core of his loneliness. What these two endured to get to this stage of love makes you wish for the impossible. If any characters every earned a happily ever after, these two did every step of the way. You can just sense it every time they are together. Unless you have loved this much, you can’t feel this much pain in having to say goodbye. If you think you are ready for this – you are in for a shocker. I broke all records for crying so much just in one episode -mostly in the first half. It was like nonstop. Holding onto a love shouldnt be this hard, but I am so glad they don’t ever stop trying. I haven’t cried this much in ages. With every step she took, my heart leaped to my throat. The tears formed before she even got her shoes on. This was the moment I was dreading and no matter how much you think you can handle it, you are fooling yourself. As she looked around, flashback scenes went on in my head. I remembered how she would hitch up her skirt and run through the streets as arang the fearless ghost. Then when she came back as human and practically skipped down the street from joy. All of her memories -both good and bad – flashed in those few seconds. Then that lump in my throat just got bigger and I thought I would choke. If that’s how I felt, I can’t imagine the pain in her heart. It must have felt like deadweight, drowning her in misery. I am having the most daebak week of recapping EVER – This show is the best it has ever been. I lost track of how many times I screamed, cried, and held my breath. This girl has been touched by death far too many times for one lifetime and yet what I love the most about her is that with each new one, she isn’t becoming more immune to it. Quite the contrary, she is learning more about how it feels for the person left behind as well as the person who has passed away. Instead of being resigned to die, she is finding it more important to embrace life. Just as she was convincing in getting an audience with the jade emperor, I hope she gets to meet him again just so she can tell him off. Only she could dare to lecture him and Jade really has it coming after all that he put her through. I really hope Jade gets to see her tears and realize they are no longer about herself – these days it’s for the people she has lost or will lose. I just pray that this death is the last one, but knowing this drama, I expect there will be one more. But in his case, his death will free him of his remorse so it will be more merciful than sad. That’s what I keep telling myself, but I don’t believe it cuz I know my tears will flow like a river that night. I thought this interview was too cute to pass up so I wanted to share this with you guys. This is what you do when your heart feels weary and just want a few moments of peace. 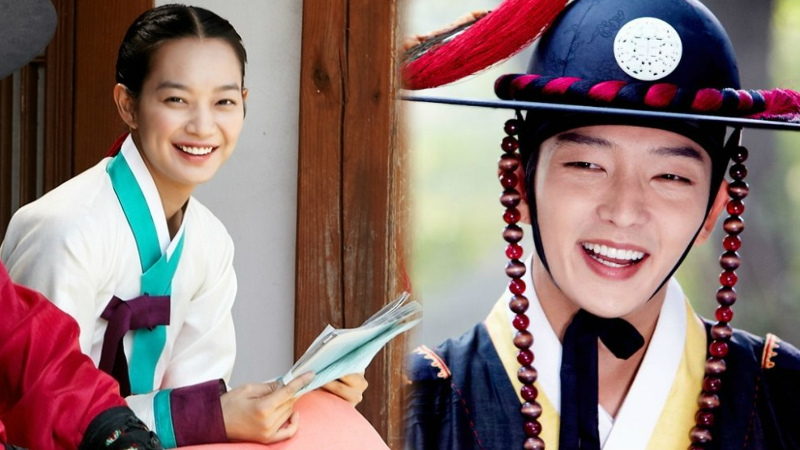 For Arang, this is about the only thing she can do now – quietly lending her shoulder for him to lean on her strength for a change. I’ve been keeping track of how many times she has done this now so I am curious. Why does she think turning her back to him will silence the deafening sound of her heart racing as his confession sinks in and breaks down her resolve with each loving word. Maybe she thinks if she doesn’t look him in the eye she can still fool him into thinking their love could be pushed back. Or maybe she is deluding herself into believing she can keep this up if she doesn’t have to face him as he says words that would have made LSR swoon. That begs the question – E fell in love with Arang, but who is to say he couldn’t have fallen in love with LSR as well. Not just cuz they feel like two different individuals either. The heart is still the same even if their spirits are different. Arang may be braver and have great survival skills, but LSR knew how to love. She wouldn’t have made E suffer this much by holding him at bay. I really wish a little bit of LSR would come back cuz knowing her, she would’ve accepted him with open arms. She wouldn’t have had the courage to pull away like Arang. I’m getting scared for E cuz just how many more times can you let someone turn their back to you before you had enough. I rather he wasn’t tested so we don’t get that chance to find out.